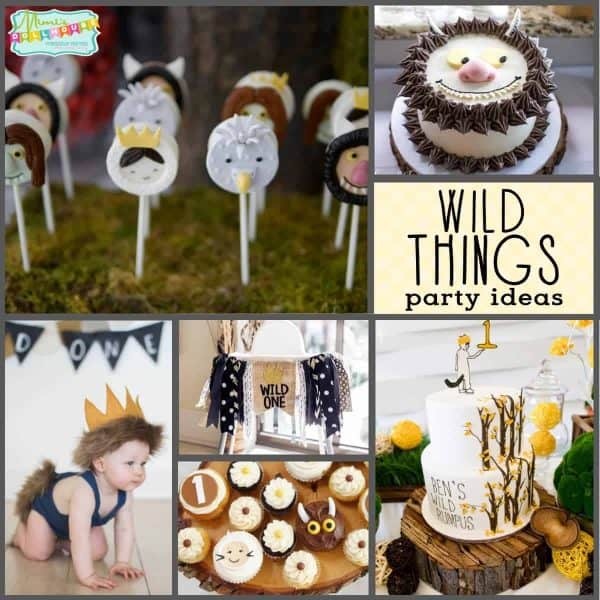 Wild One Birthday Party: Where the Wild Things Are Cake, Decor and More!! Wild Things is one of the hottest trends in birthday parties. We have some amazing ideas and wild one birthday party inspiration to share today. 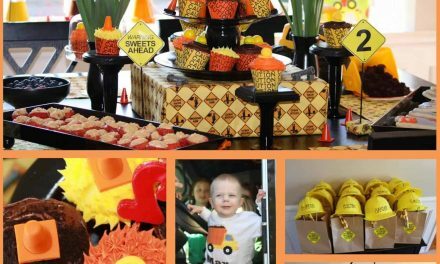 Whether you are throwing a Wild Things baby shower or a Wild One birthday party, these ideas will blow your mind. Check out our boho party ideas and woodlands party ideas. This season is all about the wood grain and rustic parties. Whether its boho chic or it’s woodlands or its antlers, you can’t go wrong with some rustic elegance. 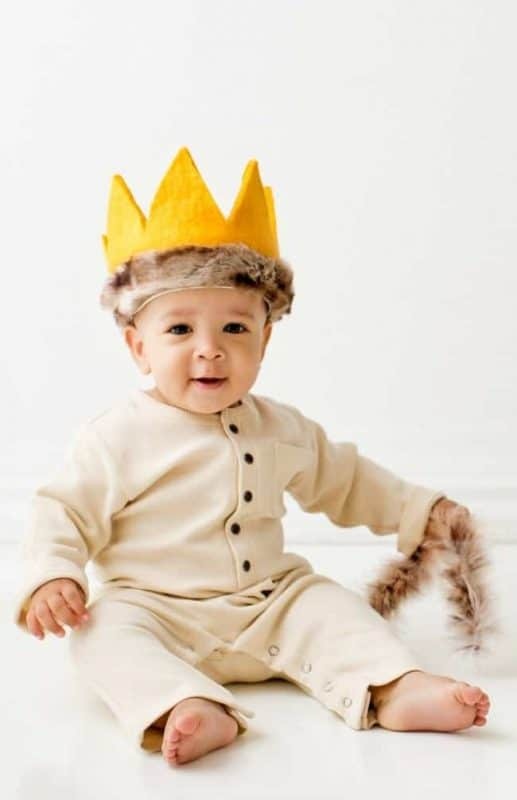 One of the hottest trends in boy’s parties right now is the Where the Wild Things Are party themes. 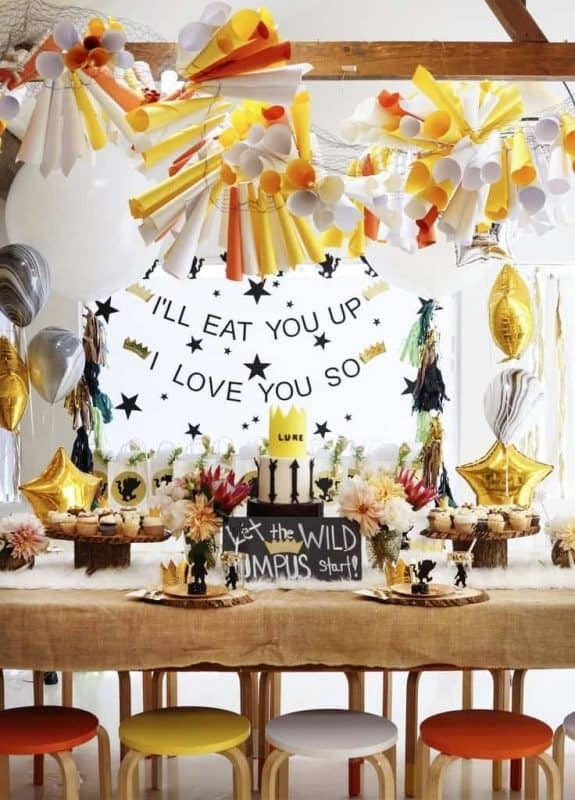 You can have a Wild Things Baby Shower (I actually used this theme for MY baby boy’s shower a few months back). You can also have an absolutely adorable Wild One birthday party. This is particularly perfect for a first birthday party theme. Yummy, yummy…I love me some cake!!! These cakes are to die for too. So beautiful and so…well you’ll see!! 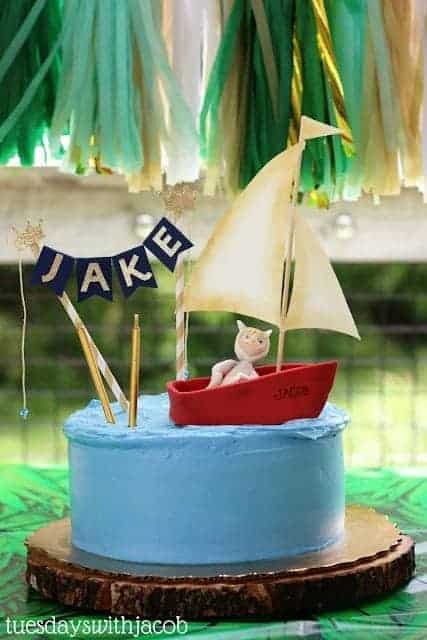 This adorable boat cake topper was made by The Cupcake Stylist. This cake topper is everything. if I could mold fondant like this…I’d never do anything else. Seriously….it’s perfection. Even the shading detailing on the sail of the boat. I’d say I’m speechless, but we all know that isn’t true!! This cake might honestly be my favorite cake EVER. It’s so simple and perfect and white. But then you see the kind of messy “hand drawn” trees and the little Max on top. It’s so simple and yet captures the feel of the Where the Wild Things Are book perfectly. And I wasn’t kidding about those colors, right!! 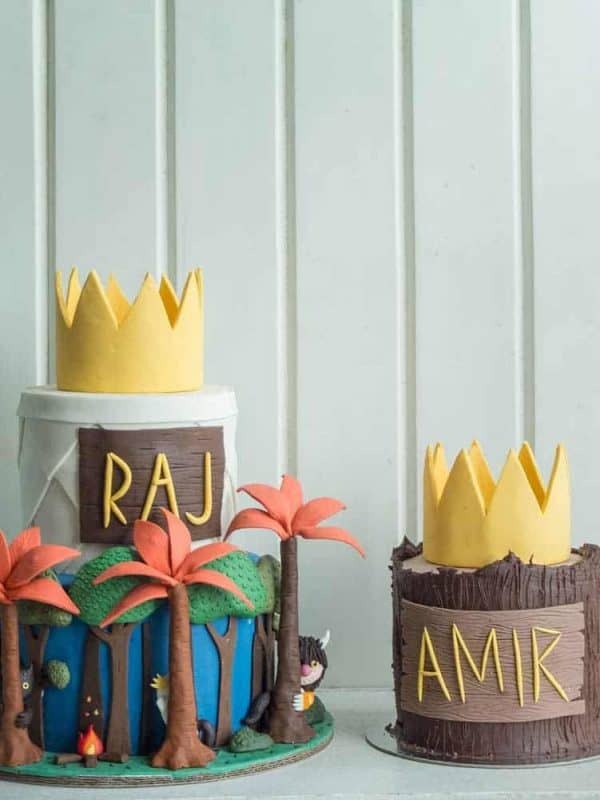 Just in case you thought one Where the Wild Things Are cake was enough to rock your socks, Cottontail Cake Studio takes it up a notch with TWO Wild Things Cakes. Let’s take a moment to appreciate those amazing fondant figures and trees. 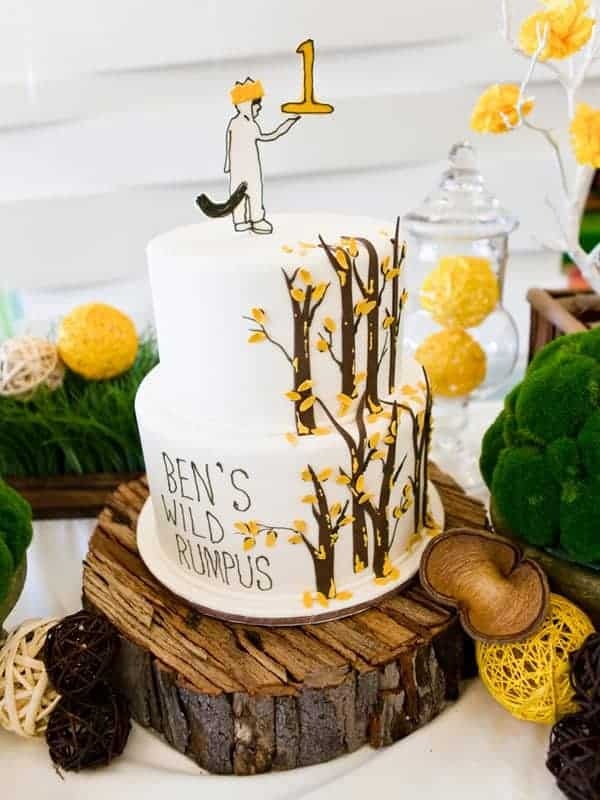 I love this Where the Wild Things Are Cake. It is perfectly adorable, but also would be a fairly easy to DIY. Using fondant and frosting and this icing tool. Absolutely perfect. I love creative takes on cakes. While the tiered cakes can be beautiful, it’s cakes like this that make me smile!! 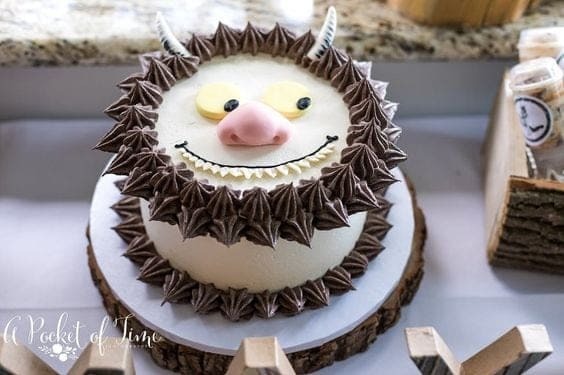 Looking for an easy DIY Where the Wild Things Are Cake? This tutorial is awesome-sauce. 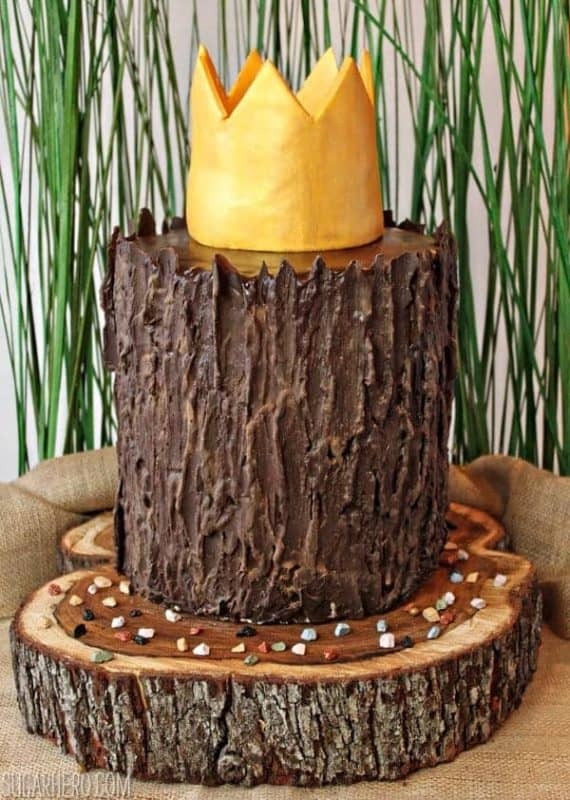 Who knew you could make a cake look like a tree stump. I totally, totally dig this cake. I love that it is super simple and yet it completely captures the feel of the book. Adorbs!! Ok, do me a favor..if you are gonna be a mom who throws gorgeous parties, also..also…dress your kiddos for those parties. I mean, there are levels. I have plenty of parties where my kids just match the color scheme. But also, I have plenty of parties where they have adorable matchy matchy party specific outfits. Either way, your pictures will be better and your party more cohesive if you coordinate the kid!! If you are going to have a more elaborate costume. This DIY max outfit is adorable. I love the details. This would be perfection on a little wild one. Dressing baby in a sweet non-costume is also absolutely adorable. 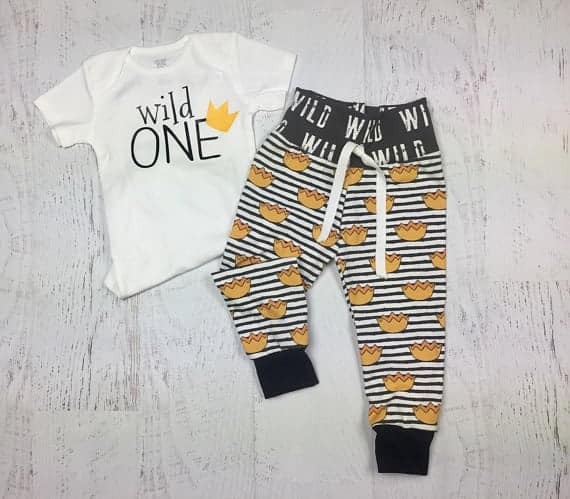 This little Wild One birthday party outfit is precious. 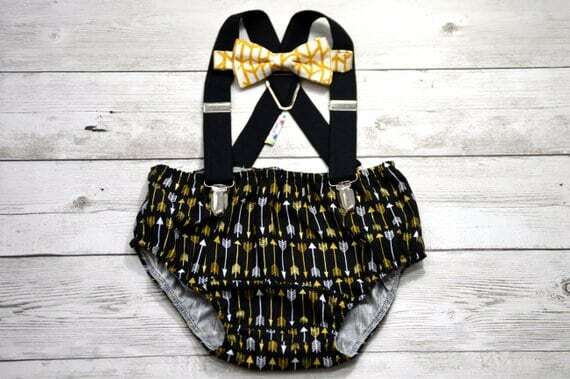 ALso, stay away from the costume idea, but step up the class with this cutie cute cute suspenders and bow tie are little boy amazing!!! I love the boho feel. I know this would be perfection on a little chubster!! There are also adorable options if you would like to have a cute custom costume, but don’t feel particularly up to the task of sewing a costume yourself. 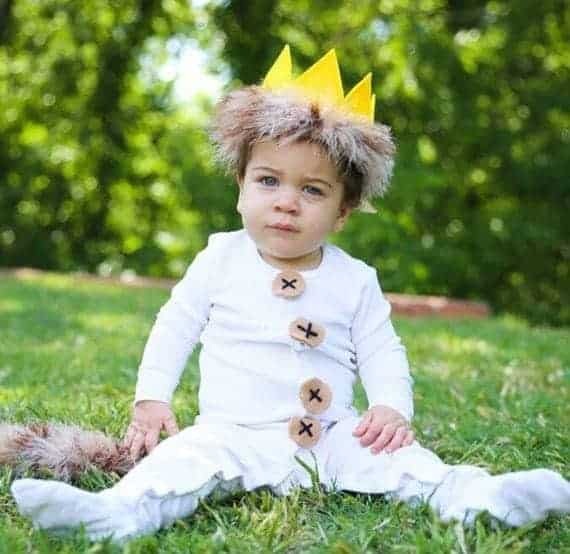 This Where the Wild Things Are costume can be ordered handmade and is oh so cute!!! Bonus…Looking for a cute Halloween costume for your kids? 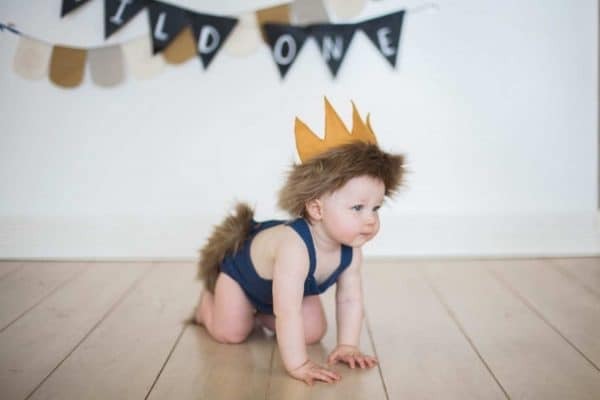 This Wild Things costume would be adorable for Halloween!! Don’t stop at just a cake. Where the Wild Things Are desserts are where it’s at! 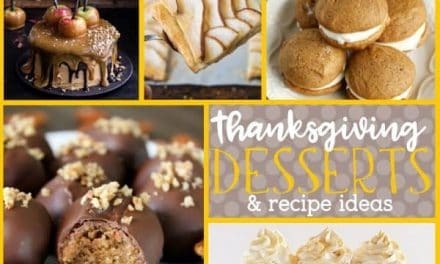 From do it yourself Wild Things cupcakes to specialty ordered Wild Things cake pops, these desserts are sure to wow your guests and delight your taste buds!!! Ready to get that sweet tooth craving for more? I love everything about this sweet display of cupcakes. When I make cupcakes, I tend to make them all the smae size and frost them the same. 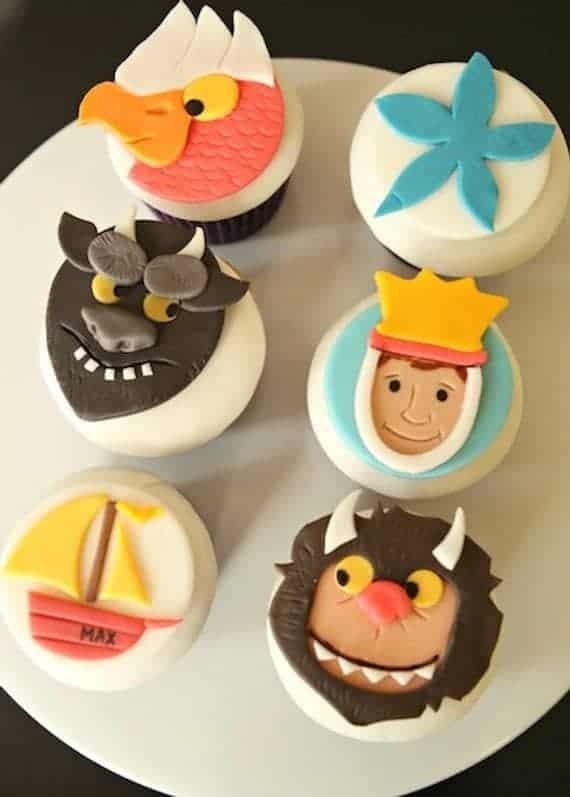 This collection of Where the Wild Things Are cupcakes in different sizes and flavors and designs is just…perfect. It’s so perfectly sweet and arranged on the wood tray. If these Wild Things Oreo pops don’t make you go “Oh my goodness” then I quit. The details are amazing. Making Oreo pops is fairly easy using this simple mold. Now, getting theme to look this spectacular…there unfortunately is not a mold for that!! One thing I like about oreo pops, they are another dessert on a stick option that is not cake pops. 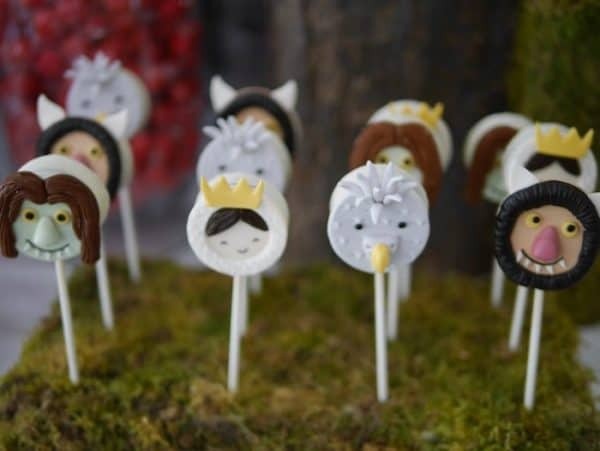 I love, love cake pops…but having some Where the Wild Things Are Oreo pops, too! Heck, yes!! Of course…these Wild Things cake pops are also freaking awesome. Cake pops are hands down my favorite dessert to actually eat. The combination of cake and frosting…it’s my kryptonite for sure. 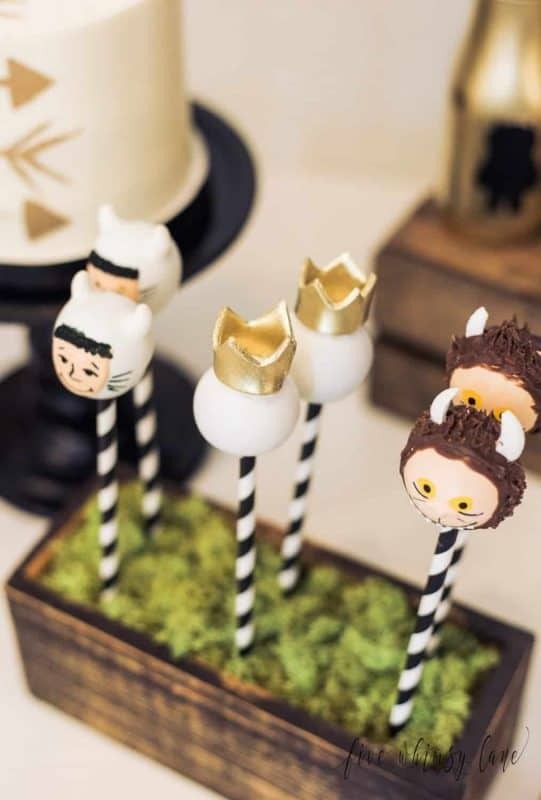 I love the design of these Where the Wild Things Are Cake Pops. Something simple to use when making these intricate designs is definitely edible markers. They are the perfect way to make cute little faces on cake pops. Looking for a cute Wild One cupcake idea that is unique and easy to make yourself? 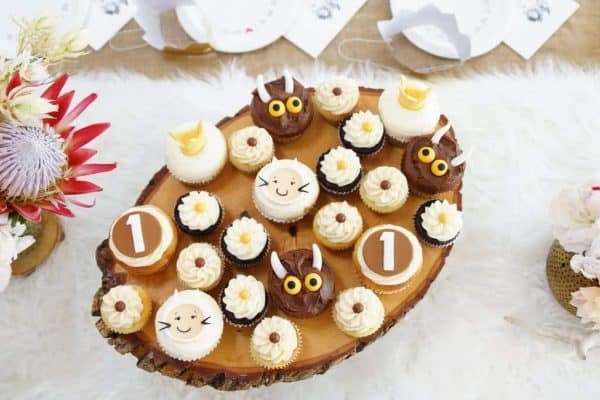 These Wild One cupcakes are so adorably cute and easy to make. Your little wild one and his party guests with love sinking their terrible teeth into these chocolate cupcakes! 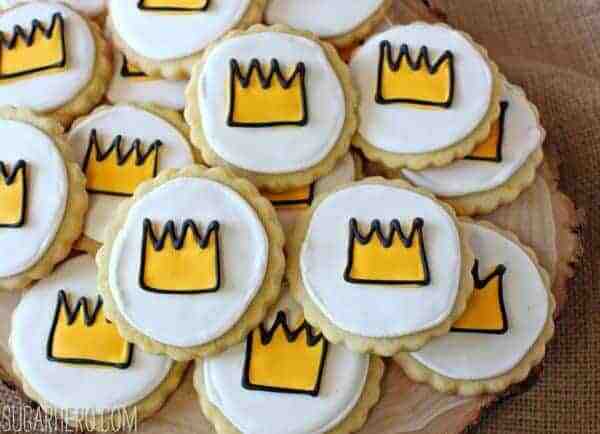 Sugar cookies are so much fun for a party This tutorial is easy to follow and the crowns are are perfectly imperfect…just like the illustrations in the Where the Wild Things Are story. I love when desserts and designs are meant to be a little “messy” and these Wild One cookies are just that! 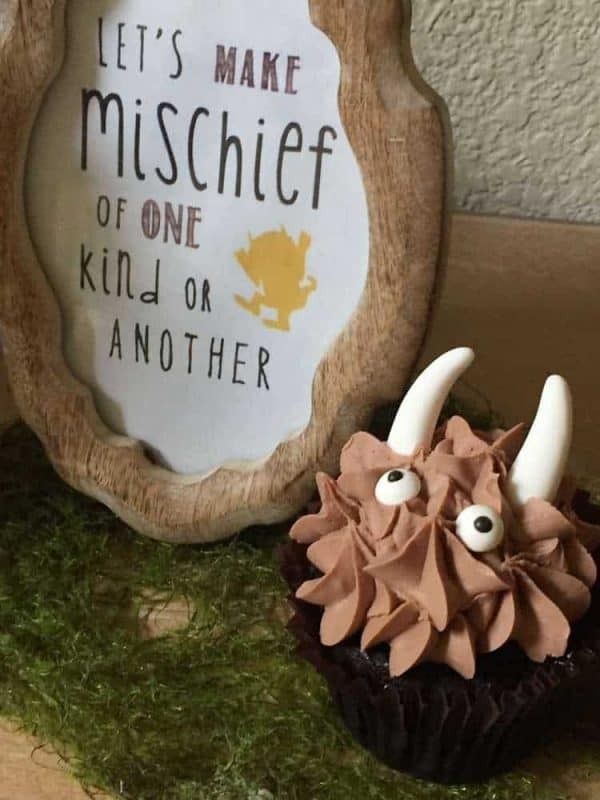 Here is another adorable DIY Wild Things cupcake idea. These simple chocolate cupcakes are topped with candy eyes and fondant horns. So unbelievably simple and so perfect for a Wild One birthday party. Let’s gnash our terrible teeth into these too!! Another awesome wild one birthday party cupcake option is definitely these super adorable Wild Things fondant cupcake toppers. Fondant cupcake toppers can be used on cupcakes or places on lightly frosted sugar cookies. I love that these Wild Things cupcake toppers show all the Where the Wild Things Are characters and add a pop of color to the party. Awesome sauce!!! No Wild One birthday party would be complete without some wild and wonderful decorations. 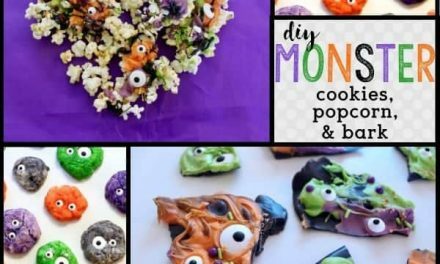 Here are some easy to replicate and sure to impress Where the Wild Things Are decorations ideas. Whether you choose to highlight your Wild One’s age or name, these letters are adorable! 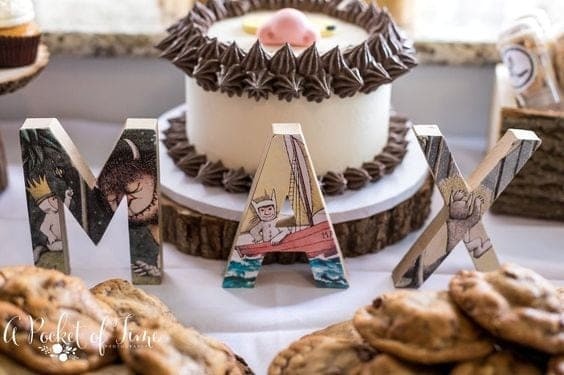 Taking simple wooden letters and covering with white felt, moss and adding a paper glitter crown (and of course some fur), is such a simple and adorable decoration for your Wild Things dessert table or Wild Things smash cake photos. Looking for a simple and inexpensive backdrop decoration? How about rolling some paper cones and sticking them in chicken wire? Genius, right? I also love that this incorporates some bright orange into the design. Perfection! 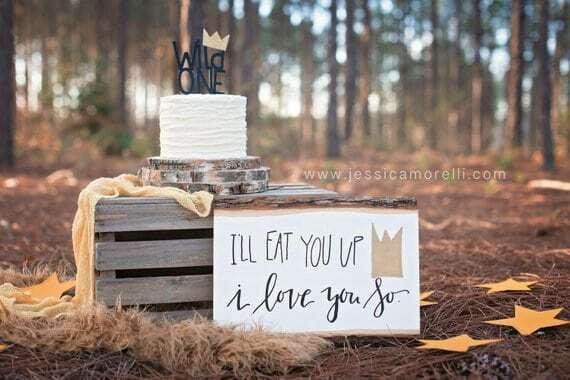 This handmade Wild Things sign is a great party decoration or a perfect addition to a Wild One Smash Cake photo shoots. Adorable! Want to take your Wild One birthday party to the next level? 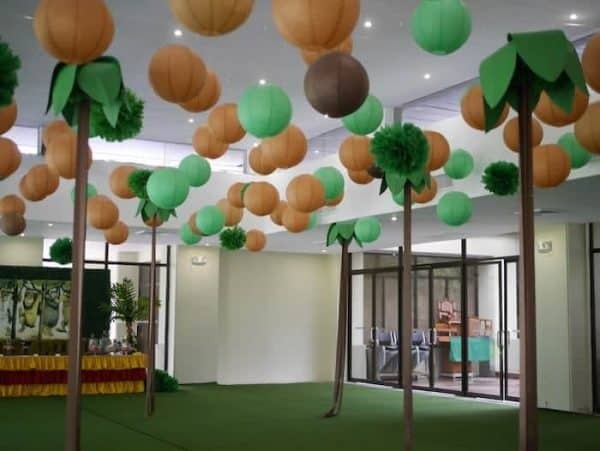 Try creating a whole world of Wild Things with hanging paper lanterns and trees. It’s as simple as hanging green paper lanterns and tan paper lanterns from the ceiling. You don’t have to be terribly crafty to pull this amazing look off. Throw in some over sized leaves…and it’s a Where the Wild Things Are Forest! Another adorable backdrop option is balloons. 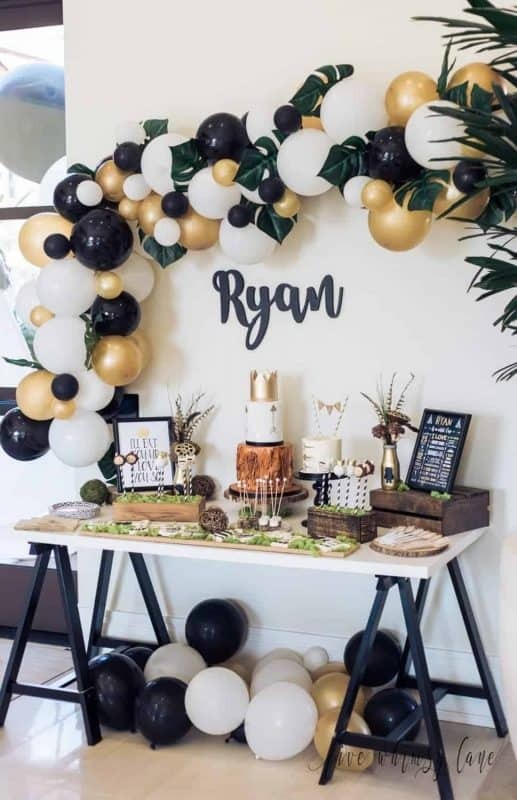 For this Wild One birthday party, a mixture of gold, white and black balloons paired with some leaves. To create the different sizes of balloons, simply put less or more air into the balloons. Super easy right!!! Another adorable idea for name or age letters is to cover kraft letters with pages from the actual story book. 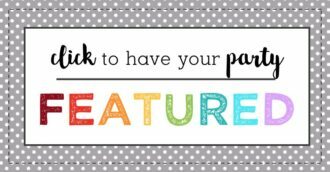 Choose your favorite scenes and craft away using modge podge! 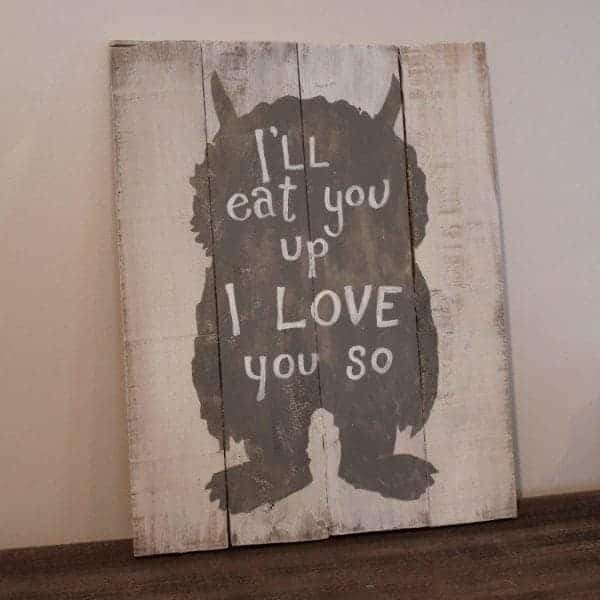 Here is a fantastic DIY Wild Things sign. I love the rustic feel of this one and how easy the tutorial is to follow. Check it out!!! If you are throwing a Wild One birthday party, chances are good it’s for your little one’s first birthday. 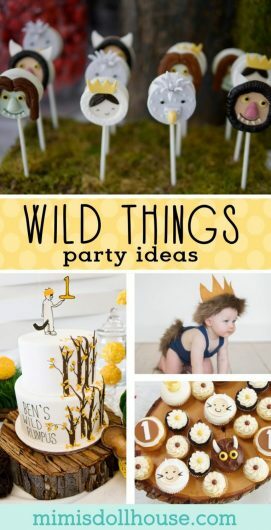 Here are some Where the Wild Things Are first birthday ideas just for you!!! Style a Wild One first birthday smash cake photo shoot. Isn’t this little outfit just the cutest. Honestly, though…if you have a great party outfit, set aside sometime with your photographer or your camera and snap some smash cake photos! You will love them!! Smash cake party time just wouldn’t be the same without an adorable Where the Wild Things Are High Chair banner. I love the ripped fabric and burlap on this beauty!! Did you take pictures of your little Wild One all year long? 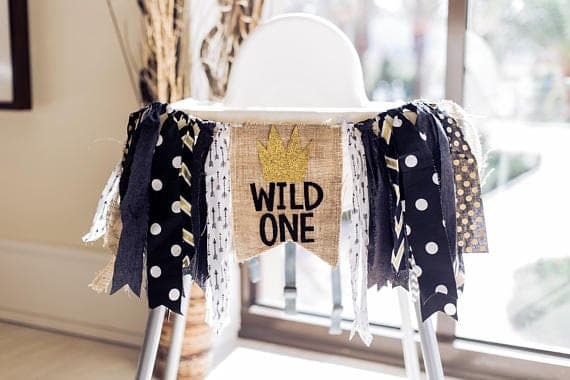 Choose your favorite from each month and create a “One Wild Year banner or board to display at his Wild One birthday party! Winning! 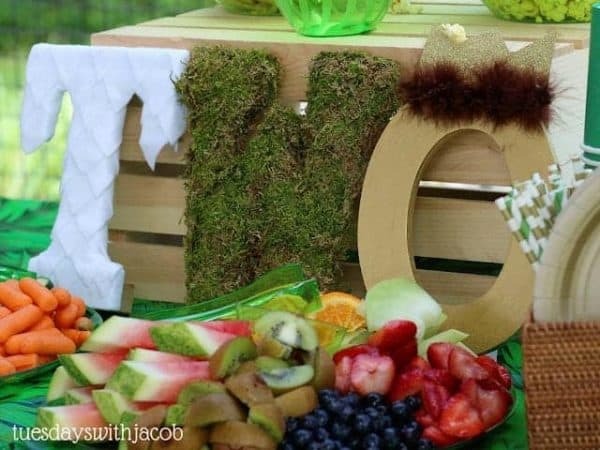 If you like these ideas, check out this Wild Things Baby Shower. Also, check out our boho party ideas and woodlands party ideas. Want to throw a Wild One Birthday Party? Oh, how cute! I absolutely LOVE this theme. You had such great attention to detail when planning this! This is so precious! And those cakes! I’d bake them just for me, no party needed lol. Please tell me these are all curated images… you’re creativity and technique are unparalleled!! Absolutely amazing. Some of those cakes and cupcakes are seriously works of art! 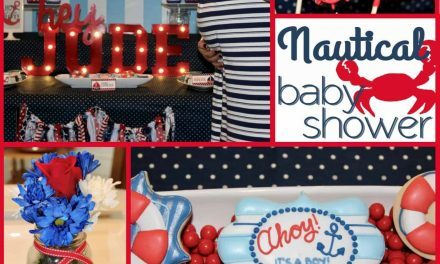 My sister almost did this theme for my nephew’s first birthday, and now I wish she had because it’s such a cute party! This is one of the cutest birthday ideas’s i’ve seen! It brings me back to my childhood. Everything really looks amazing. Nothing makes me happier than an adorable party theme! You have done an amazing job with this theme! Oh my word! Little mister in the crown and tail!!!! I can’t get over how cute that picture is. Such a beautiful theme! Little boys and girls will be amazed! And the wild ones, oh they look so cute in there! Wow, these are such a beautiful birthday themes and beautiful cake decor. I will show up this post to my daughter to choose for her birthday theme party and for her cake decor. Ahw.. this is really wild… but undeniably cute! If all wilds are like these, I think I’m gonna change preference! Lovely! Thanks for sharing! What a cute party for the little ones! The cakes made me hungry but then if those were my cakes, I wouldn’t want to touch them. Ugh! And I TOTALLY forgot about this book until – JUST NOW! Ha!! Love this book so much though :) although it did creep me out a little when I was younger. This was one of my favorite books as a child! I’m loving all of these cake designs! So much creativity I can’t take it! I remember reading this book when I was a kid. I bet the little ones love this theme. what a fun birthday party idea!! I have three boys who are older than one, but I’d love to create this for my youngest who will be 2 in December. This was my kid’s favorite book growing up. I love all of the unique cake options! Too cute for words! Everyone is very talented! 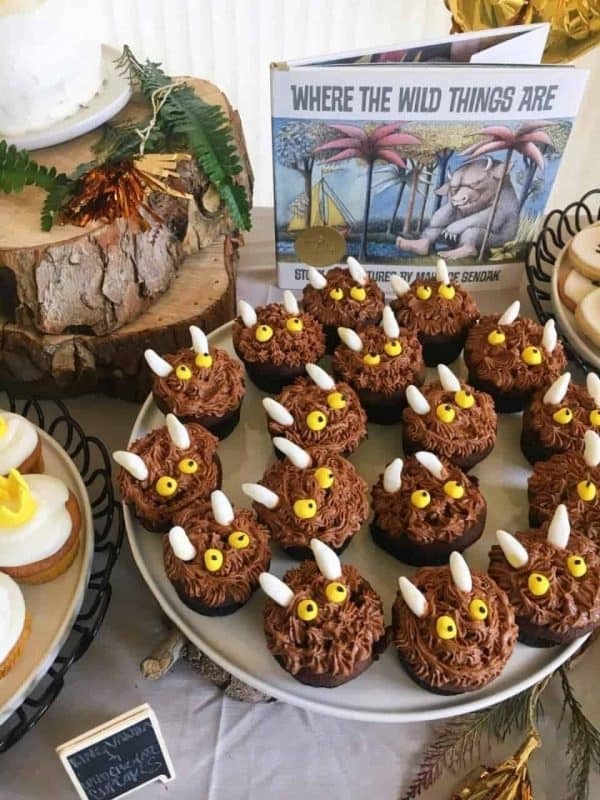 I really love the Where the Wild Things Are Cake. The baby photos are adorable too. 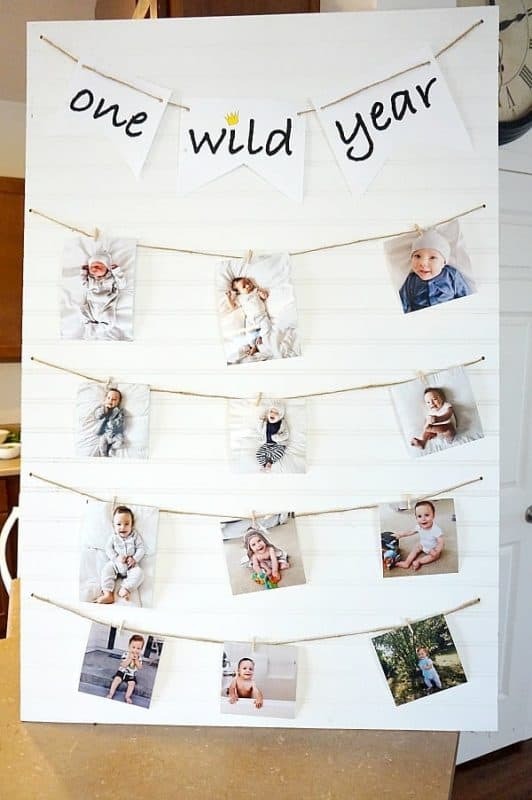 What a cute 1st birthday idea! This was my mom’s favorite book when she was growing up. I’m sure she would love if we did a theme like this one day. Thanks for sharing! I’m always astounded by cake creations with fondant. I’ve tried making little flowers and shapes and designs using fondant to go on cupcakes before and it was so fiddly and hard to get it to look good! I love these cute ideas!! There’s so many creative ways to decorate cakes and cupcakes.. Love these!